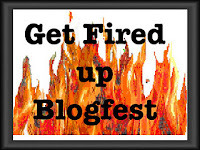 So, You're a Writer...: "Get Fired Up" Reveal! I chose to mentor one of my friends/critique partners: Melissa Maygrove. We went over the basics--how to navigate blogger, how to post and schedule posts, how to format text, how to include photos, links, etc. Create a posting schedule and stick to it. Be authentic--post in your own voice about what matters to you. Network with/follow/befriend other bloggers. Stay active. Create long-lasting relationships. Try to include an image in your posts. Participate! Join blog-hops, blogfests, contests, and campaigns. Put a link to your blog on your other virtual haunts. She needed something that reflected her personal style, so we went background hunting. Plum Rose Lane had a blue print she loved. After that, she needed a custom header. We didn't bother looking for something that probably wouldn't match, anyway. I made one in Photoshop. Then we set to work on gadgets. (GFC, Twitter, labels, blog archive, writing status, etc.) Just enough without cluttering the sidebar. When we were finished, I made her a new blog button. Melissa is an information sponge. I showed her a few tricks, taught her a little HTML, and bam--she was good to go! Talk about self-sufficiency. The woman gained sixty followers this month! it's more like: Everybody needs a Carrie. Looks nice, great job mentoring! Great advice. I'll click over there now. Looks like you make a wonderful mentor. Going to check out her blog right now. Awesome job, Carrie. Everyone should be so lucky. Melissa's blog is wonderful. It is refreshing to visit a blog that is designed so well and is easy navigate. I noticed that she has Google friend connect, but none of the names or faces are visible and you cannot join. Today is March 1st, D-day for Google friend connect, but it was my understanding that blogger sites were exempt. It is possible that she voluntarily removed it or it is temporarily down. Maybe you want to pop over and check it out since you are such an awesome mentor. I am really impressed with the amount of time and the effort you must have put in to helping Melissa. She is fortunate to have you. Best of luck in the contest. I will announce winners soon. PS. Bonus points for Meliss NOT having the captcha word verification on her comment. Big bonus. Oops. Guess I fall into the pool of suspicious bloggers, then . . .
Wow, what a wonderful campaign . . . how'd I miss this? Ah, really could use some help:( Looks like you're a grreeeaaaat mentor:):) Nicely done! Thank you, Melissa! I really appreciate that. Thank you, Giles! That's a great rule, and it's applicable to almost any kind of website/blog. :) You know what's weird, though? One of my best friends has cluster headers and he can only stand to read white on black these days. (Which is why my personal blog is fashioned that way.) The eyes are such tricky things! It really was a wonderful blogfest, Jamie! Great mentoring there, Carrie. I am seriously impressed. That is wonderful. 60 followers in a month! Way to go with the mentoring, Carrie! That's amazing. I'll be marking this post for when I get around to starting that blog, for sure XD That's some helpful advice! :) What a cool event that was! I love the idea behind this blogfest. Sounds like you had a great time being part of this. So glad to see that was on your list. Everybody needs a Carrie, lalala, everybody needs a Carrie, yeah, yeah, yeah. Seriously, you rock, Carrie. Melissa's blog looks B A D !!! Thanks for the link to the Pinterest article. I'm disappointed because it was so much fun, but it's not worth the possible backlash. I'm going to do some further research and maybe delete my account. Thanks again, Carrie. Best. Song. Ever. *grins* Thank you, Joylene! You're welcome. I was disappointed, too! I had no idea about that until my sister forwarded me the link this morning. What a bummer! You, are, a true and considerate blogger. Wonderful suggestions and a great way to reach out to our amazing community. Give yourself a pat on the back for a job well done. And, I hope Melissa has great success with her newly furbished blog. So many good bits of advice here! I particularly like the "turning off word verification" one. Golden. Melissa's blog looks so professional now. Great mentoring work! Sounds like such a wonderful campaign... and you're definitely such a great mentor, Carrie. Well done! I'm off to check out her blog. It's nice to see you back around the blogosphere. Sounds like you've been pretty busy! They're both awesome, aren't they? I love our writing community so much! :) Thanks for stopping by! Thank you! :) Oh, yes. Word verification has to go. It's so frustrating! When I first stopped by Melissa's blog for the campaign I thought it looked lovely :-) Great mentoring job! PS - thanks for offering to help out with spreading the word about Guardian tomorrow, even though you already have a post scheduled! Oh, no problem. I can't believe I almost missed it! I feel that I started out blogging with more of a brand/idea already formed of what I wanted having researched it, read about it and managed an online forum for 8 yrs previously and I agree with all your pointers, and I'm still learning along the way. Good luck with the contest. I've discovered there are lots of people willing to help out there...thank you. Better late than never, right? :) Thank you, Julie! I appreciate the kind words, and I'm sure Melissa will be happy to have you stop by.